The Rupee has depreciated steadily against the US Dollar ever since the yahapalana government came into power – a trend which has now accelerated alarmingly. The value of the US Dollar which was Rs. 131 at the end of 2014 when I left office is now over Rs.170 and continuing to slide on a daily basis. Members of the government claim that the reason for the collapse in the value of the Rupee is the appreciation of the US Dollar against other currencies. During my Presidency, the currencies of many Asian countries such as South Korea, Indonesia, Thailand, and the Philippines declined sharply against the US Dollar due to the 2007-2008 global economic crisis. Sri Lanka was one of the few countries in Asia that emerged largely unscathed from that currency crisis. Very few Sri Lankans were even aware that there was a global economic crisis in 2007-2008. The Sri Lankan Rupee which averaged Rs.110.62 to the US Dollar in 2007 was still Rs.114.94 in 2009 after the crisis had run its course. My government fought and won the war against the LTTE which had been ranked by the FBI in 2008 as the deadliest terrorist organisation in the world, in the middle of what is considered to be the worst global economic crisis since the 1930s. The government’s task is to manage crises, not to complain about them. It took some quick thinking to keep out of the crisis that was sweeping the world in 2008. When one commercial bank showed signs of stress, we placed it under state bank supervision and averted a crisis which could have affected the entire banking sector. President Trump has strengthened the US economy through a policy of giving incentives to indigenous businesses and imposing tariffs on imports to encourage local production. My government also had a policy of producing whatever we could locally and reducing imports particularly of foodstuffs such as diary products, maize, soya, sugar, onion, potato, fruits, vegetables, poultry and certain industrial products. This government in contrast believes in limitless liberalization and free trade without a clear strategy to increase exports and reduce imports. The role of a government is to keep abreast of worldwide developments and to take steps to strengthen our economy instead of complaining that a foreign leader has strengthened his own economy and that our currency was collapsing on that account. If we have a government that requires foreign countries to underperform so as to enable us to maintain the value of our currency, then this country is in deep trouble. The public should be warned that an all-round increase in the cost of consumer goods and industrial inputs will not be the only consequence of the currency depreciation that we are experiencing now. Central Bank reports show that even with the less dramatic currency depreciation that took place in 2015, 2016 and 2017, Sri Lanka’s foreign debt burden has increased by a colossal Rs. 697 billion. The government needs to raise Rupee revenues to buy the Dollars to meet foreign debt payments. The increase in the foreign debt burden this year will be very high due to the free fall of the Rupee. The reckless salary increases, fuel price reduction and tax reductions on certain imported food items given in 2015 to win the Parliamentary election of that year led to a sudden increase in government expenditure, and resulted in increased imports of fuel, motor vehicles etc. This led to widening trade and fiscal deficits and heavy borrowing to meet the shortfall. My government was very careful in taking foreign currency commercial loans because even a slight increase in the exchange rate results in the debt burden going up due to the exchange rate difference. 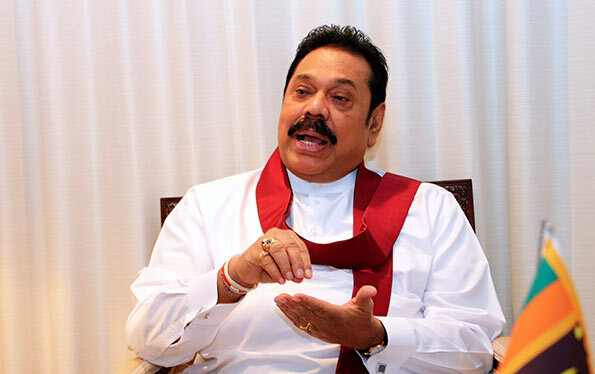 For example, my government issued Sri Lanka Development Bonds only twice a year and that too for amounts that averaged less than USD 350 million per year. The volume of foreign currency loans taken has to be carefully controlled to ensure that the economy is not overwhelmed by repayment commitments. However the present government has been completely reckless in its foreign commercial borrowings. From January 2015 to date, the total volume of foreign currency loans taken by the present government amounts to an unbelievable 20.7 billion USD, the breakdown of which is as follows – USD 8.2 billion through the issue of Sri Lanka Development Bonds from January 2015 to date, USD 6.1 billion through sovereign bonds issued in 2015, 2017 and 2018, USD 2.2 billion through currency swap arrangements with India in 2015 and 2016, USD 2.7 billion through syndicated loans arranged through international banks in 2016, 2017 and 2018 and USD 1.5 billion from the IMF Extended Fund Facility in 2016. So we now see the economy barreling downhill with the foreign debt burden contributing to the depreciation of the Rupee and that depreciation in turn ratcheting up the debt burden further. In the meantime, the rapid depreciation of the Rupee is depriving us of the benefit of declining international prices of commodities. Fuel prices were increased thrice this year. Petrol is now Rs. 149 and diesel Rs. 123 per litre in a situation where crude oil is available at less than USD 80 per barrel which is very low compared to the average of USD 109 per barrel that prevailed during the last four years of my government. In 2008, when Sri Lanka was buying crude oil at the much higher rate of USD 97 a barrel, we sold petrol at Rs. 120 and diesel at Rs 70 per litre. The present mismatch between the low price of crude oil and the high retail prices of fuel in Sri Lanka is due largely to the depreciation of the Rupee and the government tax on fuel. The reason why the government is keeping the fuel pricing formula a closely guarded secret is because it will reveal to the public both the incompetence of the government as well as the taxes they are charging on fuel. The government has been trying to downplay the depreciation of the Sri Lankan Rupee by claiming that the Indian Rupee has depreciated even more. The Indian economy however is growing at nearly twice that of Sri Lanka and they are better able to weather the shocks. We are paying a heavy price for shifting from an emerging production economy under my government to a trading economy under UNP policies. What we are faced with now is slow growth below 4%, increasing inflation, increasing imports even of items that can easily be produced locally, huge repayments of short and medium term foreign commercial consumption loans taken by this government and a Rupee that is depreciating by the day. The emerging economic crisis is the outcome of the ill-conceived economic policies of this government and the lack of a home grown economic management strategy. Former Finance Minister talking rubbish. If you are a patriot and if you think you have global financial know-how, call Sirisena to appoint you as the Yahapalana Finance Minister.